Gardening is a great way to keep your home looking fresh, neat, and colorful. As a hobby, gardening is an effective way to relieve stress and stay physically active. Unfortunately, gardening can be physically demanding and can leave you with sore hands, back, and knees. On top of that, the physicality of gardening could be holding you back from doing what you truly want with your space. If you are looking for low-maintenance, low-cost ways to make your garden shine, keep reading. If you have difficulty kneeling or bending (or suffer from back pain), raised garden beds are a great option. Beds that are 28 to 30 inches above the ground are often ideal for individuals with physical challenges. These beds are also often built in freestanding structures meaning you will have full access to all sides for maximum watering, weeding, and planting. Alternatively, you could consider transferring some of your bed plants into containers. Vegetables, herbs, flowers, and even trees can thrive in containers. This is a great way to make plants more accessible and better contained. Remember, gardening doesn’t have to happen in a yard. Balcony gardens and indoor gardens are a viable way to minimize your gardening space. Not only are indoor gardens less exposed to changing weather patterns, they are also less susceptible to weed and bug invasions therefore making them easier to manage. To make gardening less physically demanding, consider investing in a few quality gardening tools. To start, high-quality can gardening gloves reduce hand pain by protecting skin and reducing joint strain. Next, take a look at what you are using to prune. Ergonomic pruners are a great way to reduce muscles strain and hand fatigue. These pieces are designed to fit easily and comfortably into your hand. If kneeling is hard on your back and knees, consider investing in a garden kneeler to help reduce knee strain. These pieces also come with handles to make standing less of a burden. Investing in quality tools will help make gardening less demanding and more enjoyable. Having a clean, well-maintained lawn is great for relaxation, entertaining and getting outdoor time. 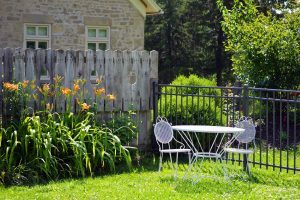 When it comes to selling a home, a nice yard can drastically improve overall curb appeal and encourage potential buyers to pay your asking price. Taking care of a lawn, even a large one, doesn’t have to be a hassle. With the right planning, your landscape should require little more than mowing. If grass isn’t your first pick for outdoor aesthetics, consider looking into some low-maintenance alternatives. Xeriscaping, for one, is an easy-to-maintain landscaping option that combines cacti, rocks, sand, and succulents to create a beautiful, desert look. Or, you could consider adding a few features to reduce lawn space – a larger patio, rock areas, or garden beds. There are a number of ways to make the most out of your garden without straining yourself, or your bank account. By making your space more accessible, investing in quality tools, and making a plan for your yard, you will be able to make your garden truly spectacular.